In this brand-new work, Carney has used Dr. Norman Vincent Peale's biblical tenets of positive thinking as a basis for a book aimed at teenagers growing up in the 21st century. The author tells how faith in God can overcome worries, unhappiness, peer pressure, self-doubts and, even, abusive parents. - Publisher A continuation of the very popular trade paper series for Teens from Guideposts. There are already three very successful books in this series and this new title on 'Kindness' will be another hit. True stories written by Teens about Teens who have displayed Kindness to someone in their lives, and the remarkable results that transpired. 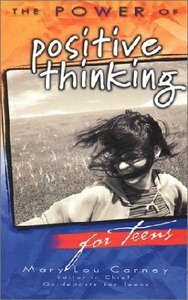 About "The Power of Positive Thinking For Teens"
A continuation of the very popular trade paper series for Teens from Guideposts. There are already three very successful books in this series and this new title on 'Kindness' will be another hit. True stories written by Teens about Teens who have displayed Kindness to someone in their lives, and the remarkable results that transpired. Carney was raised on a farm. She has two children and lives with her husband.